This device looks like a mechanical war chariot crossed with some kind of backflipped sexbot. Dubbed "Triceratops" by designer Kazuhiko Nakamura, this steampunk kaiju is just one of the artist's many fantastical creations. Check out his haunting citiscape, below, which he calls "Requiem for Industry." I am inspired by surrealism and cyberpunk styles of art. I find myself drawn to 19th century machine designs and armor among other things from that time period as motif. All of these images have been created with a portrait style while still containing a puzzle type quality. 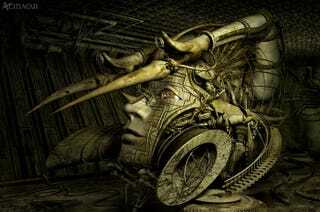 You can see more of Nakamura's beautiful clockwork puzzle art on his site, Mechanical Mirage.